Recently when I was preparing a talk on gluten-free sourdough baking, I advised evaluating a new sourdough starter’s activity and flavor by using it in a variety of trusted yeast bread formulas. Wanting to demonstrate my own advice, I tried my starter in several yeast recipes, both other people’s and my own. With one recipe in particular, the results were so good I just had to share! The yeasted baguette aux céréales as it appeared on Food52. To be clear, there are about as many ways to make bread as there are to eat it. Some other sourdough recipes I’ve developed in the past were not adapted from existing recipes and were rather different from any of the ways I make yeast-raised bread. The following is indeed a recipe for a good loaf of bread, but it’s also a demonstration of the difference sourdough makes in a loaf compared to plain baker’s yeast. My original base recipe and the multigrain baguette variation that follows were posted 6 years ago. Recent years have seen gluten-free baking tend towards fewer or single flours and less or no added starch; I too have developed plenty of recipes that reflect these changes, but as the point of this experiment was to use a familiar recipe, this formula remains as it was. Chia instead of pectin: I’ve found that chia meal provides a similar function to the pectin I used to use, and is also superior in some ways. (There will be much more information on the starch interactions and other functions of these molecules in my upcoming book - more on this to come!) Because of chia’s mucilaginous properties, I also find it’s most effective when mixed with the water rather than added to the dry mix as the pectin was. Either one will make the dough easier to handle (among other effects), but you can also experiment with leaving it out altogether since this loaf shaped as a boule requires less handling than the original elongated loaf. Teff flour instead of grain: teff grains are small enough that they can be used whole in bread, as I did in the old recipe. However, the flour gives a smoother crumb. Flour absorbs water differently than intact grains, so the water’s been adjusted accordingly as well. Sorghum option: the original recipe calls for brown rice flour, but these days I prefer sorghum. Either one should work fine in this recipe. These above changes are still just tweaks and details - the real star of this recipe modification is the sourdough. Why? The key is the mixed fermentation by a variety of lactic acid bacteria and wild yeast, which break down molecules in the flour in a way that creates different texture, flavor, and structure than domestic yeast. This is true even of wheat breads, but the difference is especially striking in GF formulas. I believe that in the case of the properties of many GF flours, this mixed fermentation is a better fit than that of baker’s yeast. Combine sponge flours in medium bowl. Stir together the water and starter (and sugar if using) and let sit for 15 minutes. Stir into the flours. Cover and set aside at room temp for 12 hours. The sponge won't rise a whole lot, but it will be split on top and bubbly underneath. Combine the tapioca, sweet rice flour, salt, and psyllium in a large bowl. Stir together 125 g water and chia (and yeast and sugar, if using) and stir this into the fermented sponge, making sure there are no lumps. Pour this mixture over the dry mix and stir/knead with a spatula until it comes together, then knead a little by hand. Cover and set aside for 30 minutes. Mix in the oil and honey. Knead again by hand and assess the stiffness - add up to 10 g reserved water if necessary to make the dough smooth, silky, and slightly elastic. Shape the dough into a smooth ball. (If you have a banneton/brotform/rising basket, this is a great time to use it! You can even try using a well-floured bowl to rise the loaf. Otherwise, just let the loaf rise on parchment.) The dough will need to rise 2 hours. After about an hour or so, preheat the oven (with a baking stone or dutch oven) to 450º F to make sure it is thoroughly heated. Once the dough has risen for about 2 hours, turn it out from the rising basket/bowl (if using) and cut slashes in the top crust. Put the loaf on the heated stone (or in the dutch oven) and cover with a large metal bowl (or lid). Bake covered for the first 11 minutes, then uncover; total bake time 50 minutes. Let the loaf cool completely (minimum ~4 hours) before cutting. (I know, I know! It smells so good you’ll want to tear it open right away! 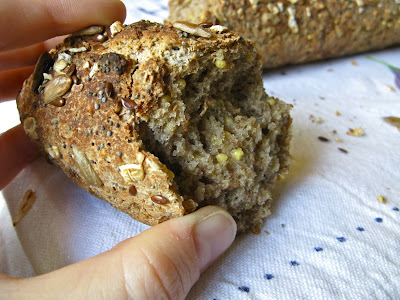 But trust me, you’ll be glad you waited - the starch structure of the bread needs to set for you to enjoy its texture.) Thanks to the sourdough, this bread should stay soft for at least a couple days if you store it cut-side down on a wooden board...but if it gets a little stiff, it will also make excellent toast! 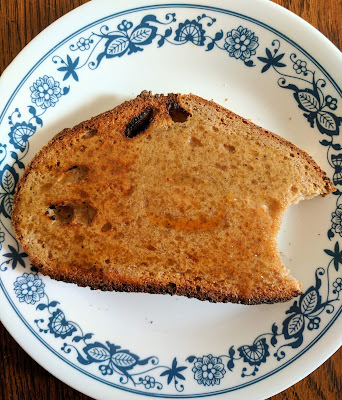 Sourdough toast with honey: simple, yet delectable. Note on added yeast: Dry baker’s yeast is a particular strain of Saccharomyces cerevisiae that has been selected for certain traits, including plentiful production of carbon dioxide to make bread rise rapidly. S. cerevisiae is far from the only yeast species useful for bread, though - in fact, when it comes to sourdough other yeast species are far more likely to occur as S. cerevisiae doesn’t thrive well in many starters. The wild yeasts produce better flavor and texture, but you might find the rise produced by your starter is slightly less than expected. If so, try adding the suggested pinch of yeast to your bread - you’ll still get all the benefits of the sourdough, plus just a little boost from the baker’s yeast. Oh my, that looks amazing! I can't wait to give it a try. Could I sub maple syrup for the honey? And is there perhaps a sub for the garbanzo flour? Almond maybe? I'm unable to eat fructans( hence no wheat) and beans & honey are also fructans sources. 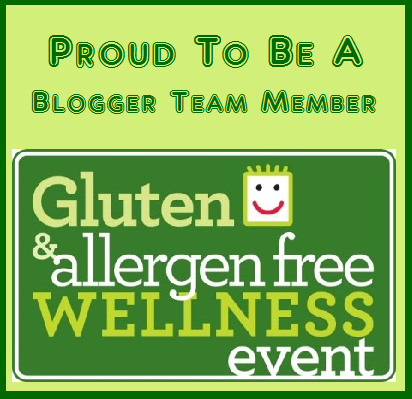 I' m also located in NC and super excited you're writing a book,I love your blog! I've never personally tried this formula without some kind of bean - however, in some of my other recipes readers have told me they have successfully used quinoa flour in place of garbanzo so if that works for you that might be a good one to start with. I'm not sure about almond in an overnight sponge because it ferments so much differently than grains and beans, but it might be worth a try also! I think maple syrup should work, though it has a stronger flavor. Maybe brown rice syrup or glucose/golden syrup? I absolutely love this! So easy, quick and super scrumptious. Perfect for a morning on the go! Thanks so much, this is my new favorite recipe!